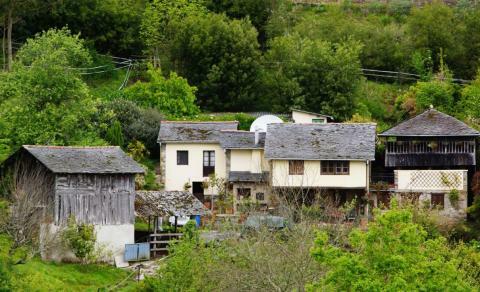 A refurbished traditional Asturian stone-built house and 5.5 hectares (13.5 acres) of land for sale in a hamlet in Western Asturias. 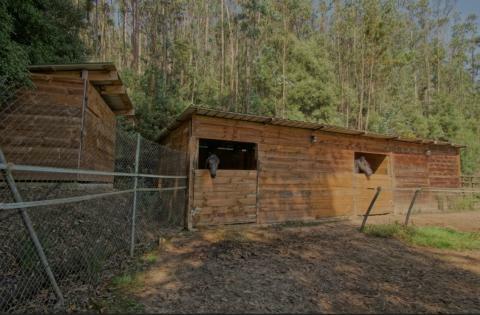 The property is in live in condition and its land has been prepared to provide complete equestrian facilities and kennels. 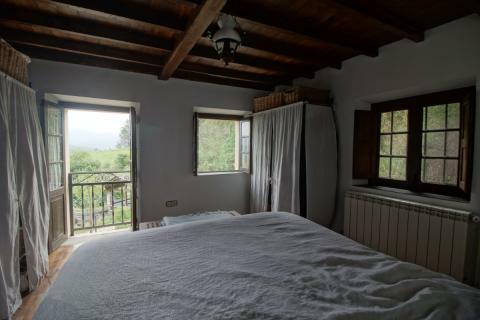 The property enjoys breath-taking views of the surrounding mountains and it is not overlooked by any other property. It is so peaceful that local wildlife, including roe deer and red squirrels, can often be seen in its surrounding paddocks and trees. 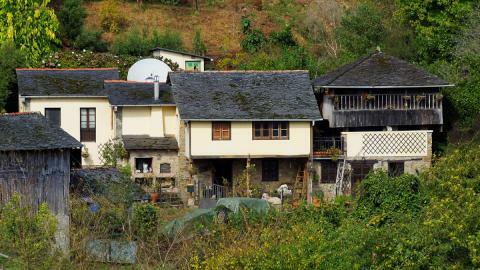 The property is situated at 4 km of the village of Trevias that has all amenities (shops, banks, schools, post office, etc. 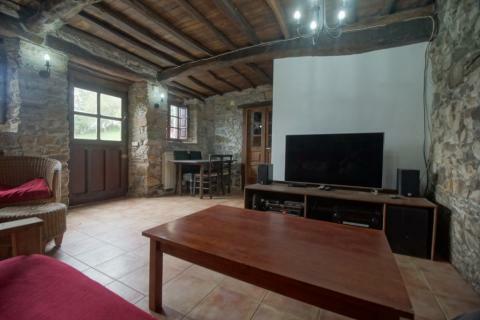 ), 10km from Luarca - the council capital-, 3km from nearest beaches and 30 minutes drive from the airport with direct flights to London Stansted. There are also ferry services to the ports of Santander (about 3 hours’ drive) and Bilbao (4 hours away). 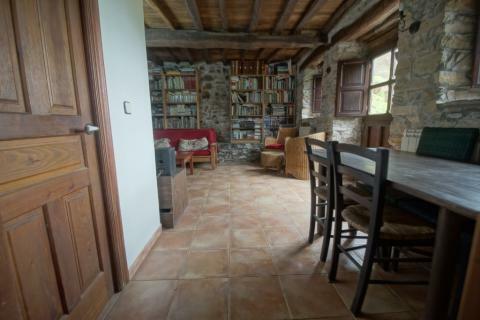 The house is situated 100 m up the hamlet with access to a wide network of forest trails and overlooking the river Esva with salmon and trout fishing. 1. 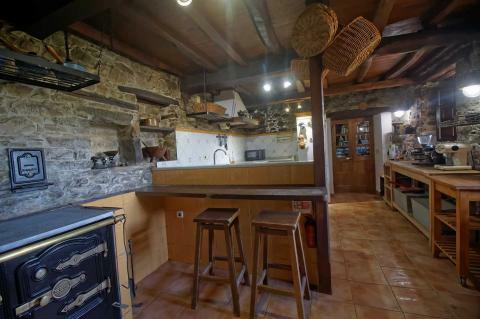 A traditional stone house with slate roof, porch and a traditional wooden granary on top. The front terrace is enclosed by metal fence and gates. 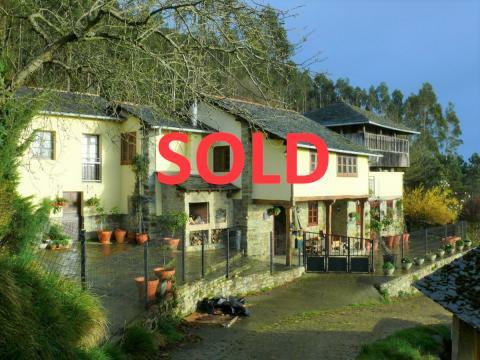 The house has a floor area approximately of 134 m2, with ground floor, first floor and attic. 2. A detached barn is sited across the house. 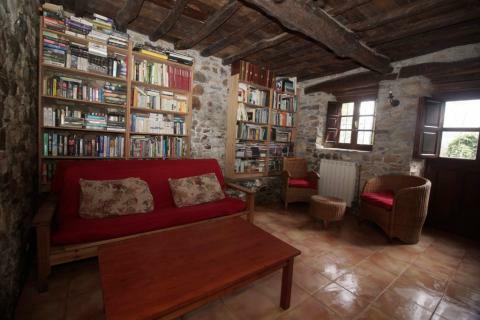 With a floor area of 60 m2 in two floors. 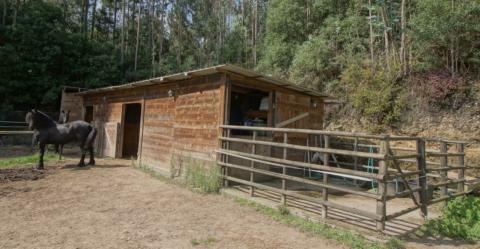 Stone built double stable underneath with electricity and water, accessed by two metal gates. 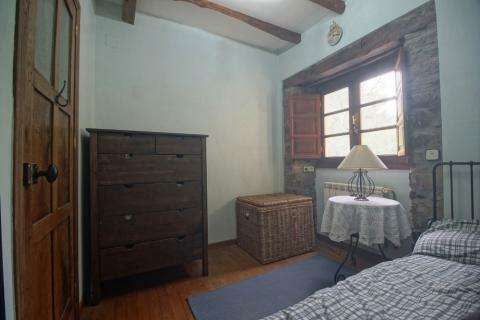 And a wooden barn upstairs with independent access. 3. Purpose built kennels and shed at the back of the house with an area of 63 m2. 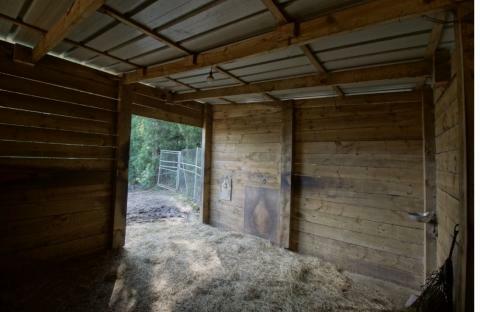 3 block-built kennels, one of them arranged for breeding, plus an adjoining shed with a bathtub. a. Timber stable block. Two purpose-built stables of 4mx4m with drinkers and electricity, feed and tack room 5.5mx4m, and enclosed shower area, 4mx4m. 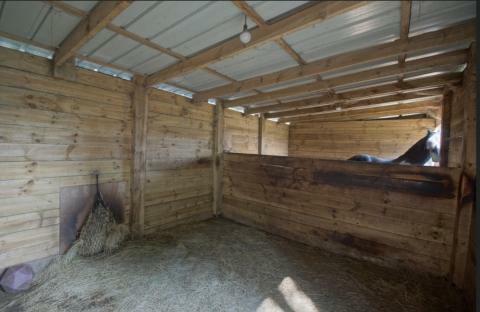 The stables can be joined to provide an open barn. b. Riding arena of approx 13m diameter. c. Separate shed over independent 3,000 ltr water tank. 5. Over 5 acres of grazing paddocks in two blocks surrounding the property and arranged in 7 paddocks all fenced off and with water drinkers. The paddocks are of different sizes. 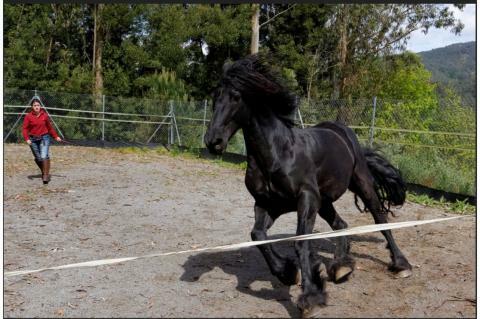 The fences are in their majority high end equine electric tape. 6. 8.5 acres of forest. Mix of eucalyptus/pine for timber and indigenous chestnut, oak and wild cherry in 4 blocks. 7. An apple orchard with different varieties of Cider, Reineta and Bramley apple trees. 8. Natural hedges of fruit and berry bushes (sloe, cherry plump, indigenous peach trees, pyracanths, hawthorn, Paul Scarlett, etc.) and trees to provide colour and food for birds and local red squirrels. 9. Over 100 fruit and nut trees and bushes including medlar, quince, loquat, orange, grapefruit, lemon, calamondin, almond, hazel, walnut, sweet chestnut, cherry, fig, persimmon, crab apple, pear, plump, etc. 10. A variety of berry bushes including kiwis, currants, gooseberries, grape, blackcurrant, raspberries, loganberries, tayberries and a small orchard of blueberries and passion fruit vines. 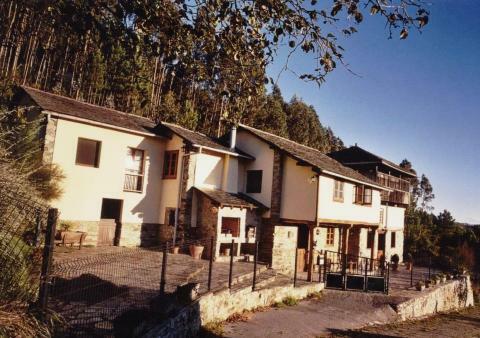 The main buildings are made of stone, with walls up to 60cm thick, and chestnut wood. 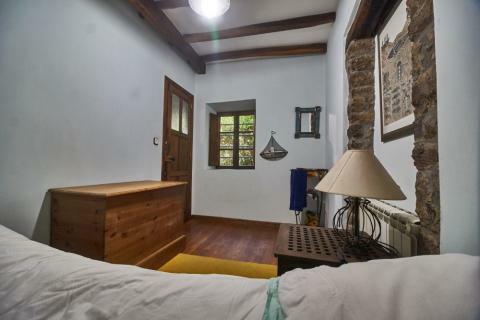 The house has many original features, having been sympathetically refurbished. It has oil fired central heating providing heating and hot water, solid fuel range providing hot water, electricity, registered free water supply and independent septic tank. 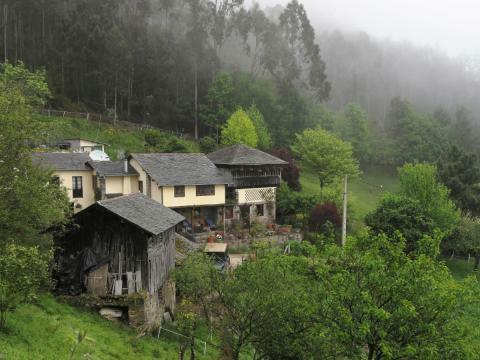 It also has satellite dishes receiving both UK and Spanish television. There is 4G internet coverage in the area. Apart from the obligatory annual Council Property Tax payment (IBI), there is a small annual community charge for the upkeep of access roads and other common services. 7 paddocks in approx. 5 acres of grazing. Tiled floor. Tiled splashback. Natural stone walls. Solid wood ceiling. Purpose built storage with tiled frontage, solid wood doors and drawers and natural marble worktop. Solid wood breakfast bar. Stainless steel double bowl sink. 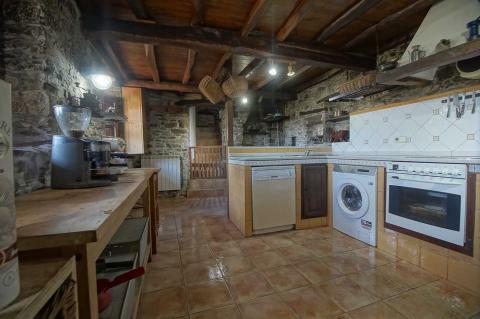 Appliances including washing machine, dishwasher, oven, cooker, and fridge. Solid fuel range providing hot water. Radiator. Window to front. Door to outside porch and terrace. Partly glazed side doors to sitting room and stairs to first floor. Tiled floor. Natural stone walls. Stone rise from old mangers to one wall. Two radiators. Door to outside terrace. Two windows to front. Solid wood ceiling. Complete bathroom white suite with shower enclosure. Tile floor and walls. 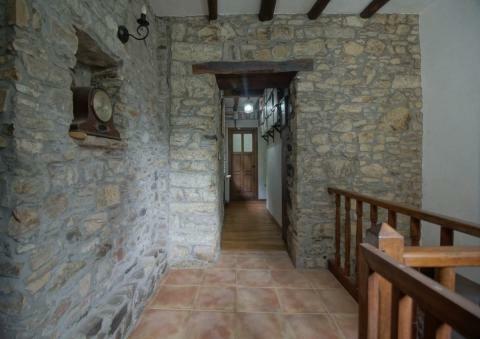 Tiled floor, natural stone walls. 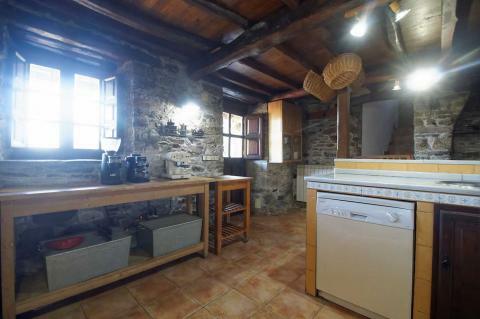 Concrete floor and natural stone walls. Two sections, main workshop section with central heating oil storage tank, and second section with boiler and hot water tank. Door to outside terrace. Part tiled and solid chestnut wood floors. 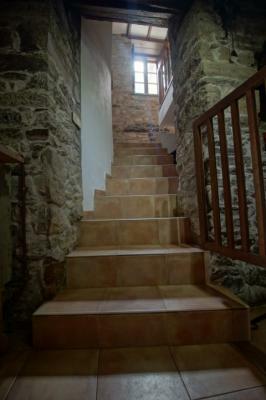 Natural stone walls with solid wood balustrade. Solid chestnut wood floors. Solid chestnut wood ceiling. Radiator. Balcony door and two windows; one to front, one to side. 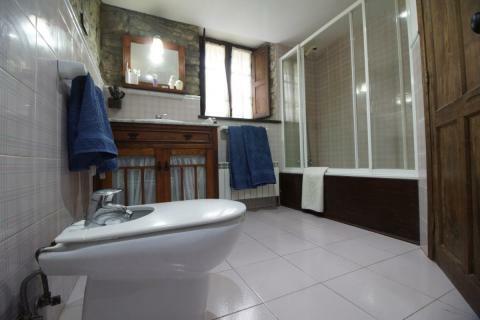 Complete white suite including bath, with enclosure, and bidet. Basin with chestnut wood storage. Tile floor and walls to mid height showing natural stone. Two windows. Radiator. Solid chestnut wood floor. Window to back. Radiator. Solid chestnut wood floor. Window to front. Radiator. 3.80m x 3.70m. Solid chestnut floor. 5.7m x 3.7m open gallery with concrete floor, used to dry wood/vegetables, etc. 6.3m x 4.2m. 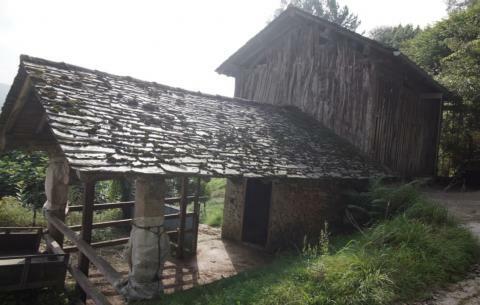 Original chestnut wood granary built on stilts with doors to all sides leading to open solid wood balconies and a closed one for the drying of meat, etc. Paved terrace, enclosed by rigid black metal fence and gates. With a fountain. Gates to outside. Post and rail enclosure. Solid chestnut wood floors and walls. Slate roof. Two stables of 4m x 4m. Made of 4cm thick treated timber planks. 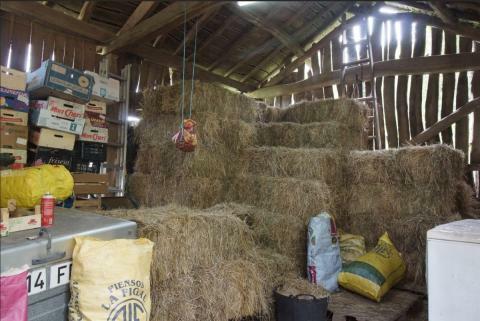 The central partition can be easily removed to provide barn type housing. Tack/Feed Room 5.5m x 4m. Block built and covered, with rigid metal fence panels and doors. Block built with metal door and window to side. Approximately 1.2 acres. Slopping paddock by the house but on the other side of the road, including a fruit orchard with mature apple trees, calamondin, fig, lemon, and persimmon trees and kiwi and grape vines. Plus several fruit trees and bushes as natural hedges. 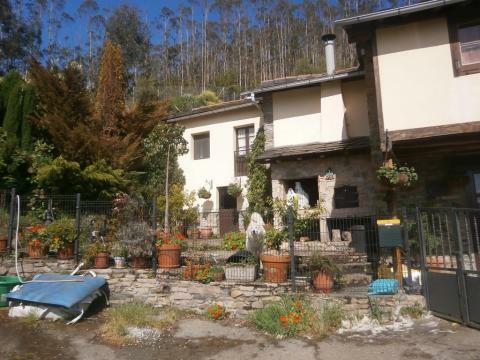 Approximately 0.5 acres, slopping paddock to the side of the house, with drinker. 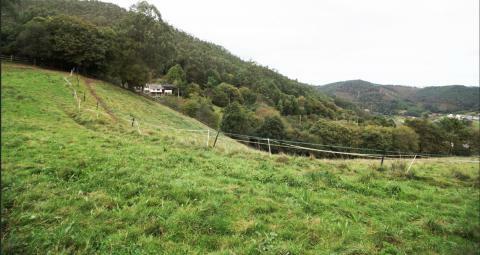 Approximately 0.3 acres, gently sloping paddock to the back of the house and linked to paddock 2. Several fruit trees and bushes. Approximately 0.75 acres, mainly flat paddock with drinker. Approximately 1.2 acres, slopping paddock with drinker. Approximately 0.54 acres, gently sloping paddock with drinker. Approximately 0.42 acres, gently sloping paddock with drinker. Approximately 8.5 acres of mainly eucalyptus and pine trees for timber, a source of income. Other indigenous trees like sweet chestnuts, oaks and wild cherry trees. Mains electricity to both the house, outside barn and stable, kennels and stable block. The water supply is free, registered, and independent to the house. Oil fired central heating providing heating and hot water. Solid fuel range providing hot water. Satellite dishes receiving free UK and Spanish television. Private septic tank. The town hall is situated in Luarca. Property tax is paid annually to the council (IBI) and includes council services like the removal of recyclable materials. The charges are around Euros 150 per year. There is no garbage collection. There are three garbage containers situated some distance away for which there is no charge (being situated too far from the house for charges to be affected). There is an annual charge for community services, like the upkeeping of access roads, payable to the neighbourhood association. In 2018 the amount payable is Euros 100 per year. The property will be of particular appeal to those seeking an equestrian lifestyle. 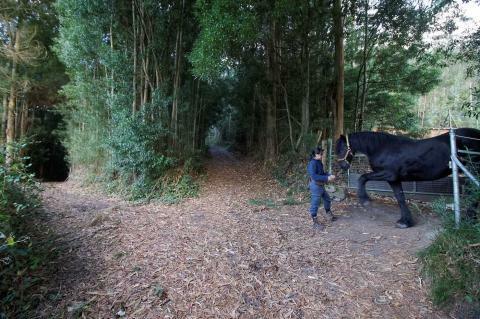 The property is 100 metres from a small hamlet with its own access road and links to an extensive network of forest trails, providing safe hacking. The village is accessed by a bridge over the river Esva, well known for its salmon and trout fishing. The hamlet is about 2.5 miles from the village of Trevias where there is general stores, Post Office, inns, schools and a local builders merchant. 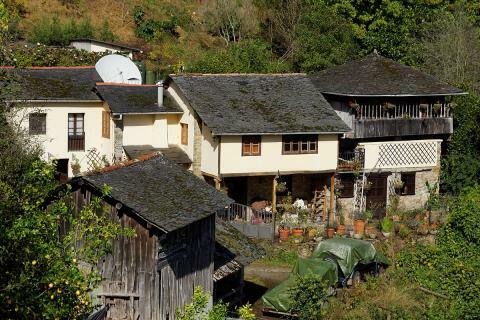 The council town of Luarca is about 6 miles. The La Cueva beach is about 3 miles.